Microsoft is trying to rekindle a rivalry with Apple, introducing two new computers this week that are aimed squarely at the creative set of customers that Apple has long-claimed as its own. A few years ago, Microsoft was an afterthought for most in the tech world. Having all but missed the mobile revolution, it was hard to believe chief executive Satya Nadella when he said last year that Microsoft would focus on making innovative products people loved. But he meant it. And Microsoft, still looking to shake off its image as the default option for the world’s cubicle workers, took to a New York City stage Tuesday to show off a generation of products designed to promote passion and creativity – not just productivity. Microsoft introduced a new desktop, reimagined with touchscreen and pen technology that have earned it a following for its Surface tablets. The 28-inch computer, called the Surface Studio, sits on sleek chrome arms and can adjust to a flat angle for writers and sketchers who want to use it as an enormous piece of paper. Its minimalist design brought to mind the obsessive simplicity of Apple’s thinnest Macs. 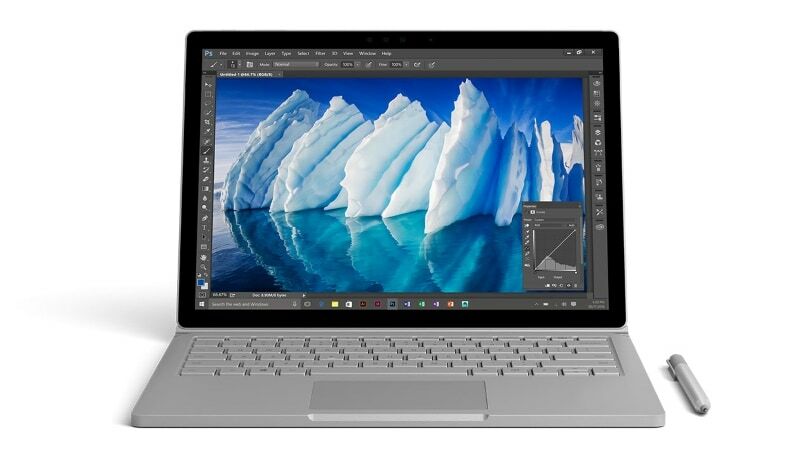 Microsoft also introduced a new version of the Surface Book, its high-end laptop, which boasts 16 hours of battery life and, according to Panay, has three times the performance of the highest-end MacBook Pro. That was a not-so-subtle dig that hints at the resurgence of an old rivalry. Microsoft’s push into a space that has traditionally been Apple’s domain – devices for creative types – comes at the same time as Apple has been touting the productivity of its own devices. Both are trying to frame their devices as products that can take customers seamlessly from work to play, at a time when the line between the two domains is blurring more than ever. Apple is also expected to introduce new laptops this week, at a Thursday event at its Cupertino, Calif., headquarters. But the MacBook maker has already made clear that it has its eye on the business world that has been Microsoft’s domain for many years, particularly with the introduction of its large iPad Pro tablet, which supports a keyboard and is sold as a possible laptop replacement – similar to Microsoft’s Surface. Of course, it remains to be seen how well either company’s attempts to alter their images stick with consumers. And both Microsoft’s new products are pricey – $6,000 (roughly Rs. 4 lakhs) for the Studio, $2,400 (roughly Rs. 1,60,000) for the Surface book – which makes it for high-end buyers. But it seems as if both firms are increasingly marketing to the same group of people. Hardware isn’t the only place where Microsoft is trying to change its image. The firm also showed ways it plans to bring 3D-modeling, virtual reality and augmented reality into the mainstream. The company’s new “Creators” version of its Windows 10 operating system, due out in the spring, lets anyone scan and manipulate 3D objects into their computers to place in sketches and PowerPoint presentations. The Windows 10 Creators edition also has more user-centric features such as a “people bar” powered by Microsoft’s Skype, that will give users easy access to their most-used contacts. Users can also edit emoji, to fit their own personalities. Microsoft also showed off a native program called Beam that lets users stream video games from their PCs. Echo, Echo Dot, or Echo Plus: Which should you buy in India? Ep. 104: A Surefire Way to Make Grandma Happy + more!